It was Halloween night me and my friends Jake, Kayden and Bob went on a massive trick or treating hunt. We got so many sweets that our buckets were overloaded. We needed somewhere quiet to stuff our faces with sweets and chocolate. Kayden suggested to go to the abandoned house near the graveyard. As we walked in the floorboards creaked and we looked at each other with fear but we still continued on. We had just settled down to eat our sweets when we heard glass break and a loud scream . The lads turned around laughing because the scream had come from me. Looking at the picture and reading your story, it was a pretty huge haul of sweets that you all got on Halloween, Ben! I really loved this story, as you described everything so well – the creaking floorboards, the way you all looked at each other. Fantastic descriptive writing. Keep up the super work Ben! This is a terrific story Ben. You’ve used excellent vocabulary and adjectives to describe what sounds like a very successful ‘Trick or Treat’ Halloween night. Very well done. I like the way it was a scary story. I hope you write more. Well done on completing the 100-word challenge this week. Going to an abandoned house to stuff my face wouldn’t be my idea of fun. I’m wondering why you screamed? Did you get a fright? Or was it a prank? 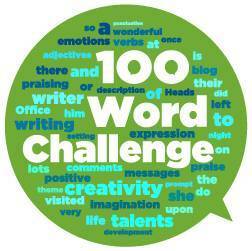 It’s great to read your work on 100 word challenge. You really created a lot of suspense in your writing. Your use of description painted a very clear picture. I’m eager to know what happened next and what made you scream. That was a super cliffhanger.